Extra large size (41.18mm x 50.47mm) rhodiumized 18K white gold case set with round diamonds, circular-grained crown with set with a diamond, satin-brushed rhodiumized white gold sunray dial with 12 diamond set hour markers, quartz Cartier caliber 688 movement, toile brossée fabric strap with rhodiumized 18K white gold adjustable deployant buckle. Water resistant to 30 meters. 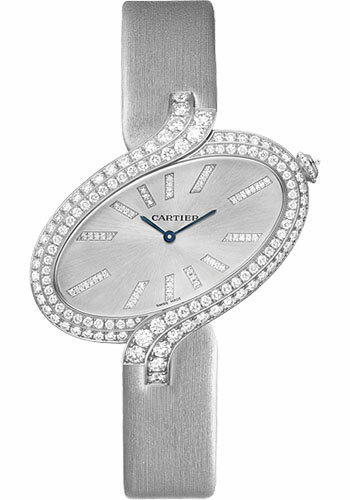 Extra large size (41.18mm x 50.47mm) rhodiumized 18K white gold case set with round diamonds, circular-grained crown with set with a diamond, 18K white gold diamond paved dial, quartz Cartier caliber 688 movement, toile brossée fabric strap with rhodiumized 18K white gold adjustable deployant buckle. Water resistant to 30 meters.